Hurricane Jose Upgraded To Category 4 - Joe.My.God. As Hurricane Irma makes its way toward Florida, two other hurricanes are gaining strength as they near land. Hurricane Jose is now an “extremely dangerous” Category 4 storm. It’s still forecast to steer north, potentially avoiding any impact to Florida. It’s 535 miles east-southeast of the Leeward Islands, which were battered this week by Irma, according to the National Hurricane Center. 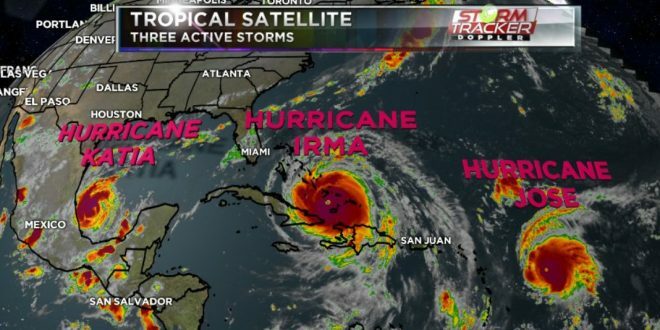 Meteorologists said the storm is moving 16 mph and is forecast to continue strengthening Friday before it closes in on the Caribbean islands Saturday. A hurricane watch is again in effect for the islands of Antigua, Barbuda, Anguilla, St. Maarten, St. Martin and St. Barthelemy. Meanwhile, Hurricane Katia continued to strengthen as it meandered in the Gulf of Mexico. The storm has 100-mph winds and is forecasted to make landfall in Mexico on Saturday.